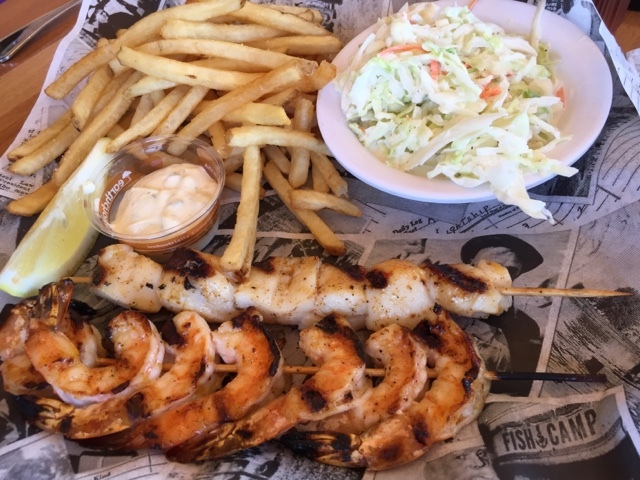 Fish Camp is a casual restaurant, located north of downtown Huntington Beach. 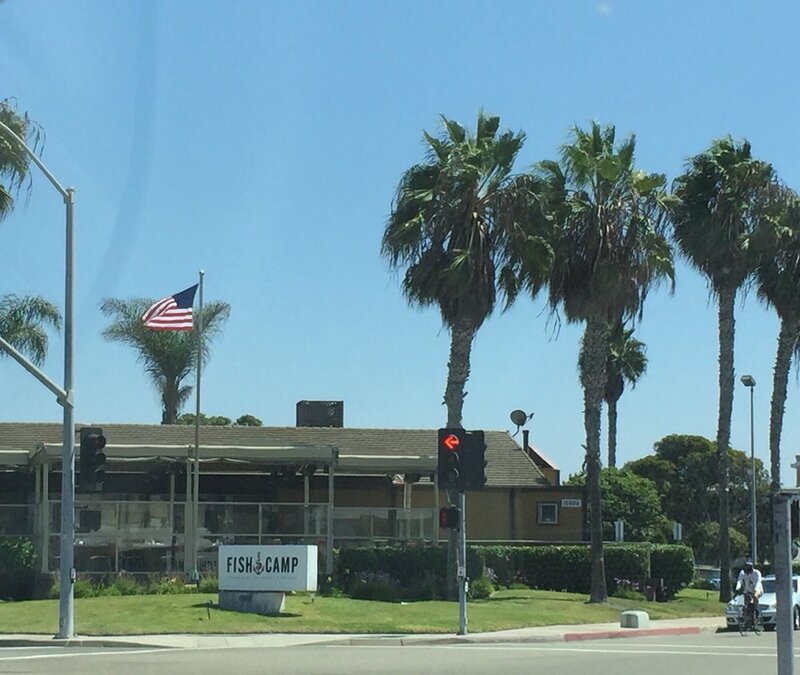 It is easy to find, literally on the corner of PCH and Admiralty, with plenty of parking. We came here for a birthday gathering on a Saturday afternoon, and I was afraid that we wouldn’t be able to get a large group here. I was wrong. 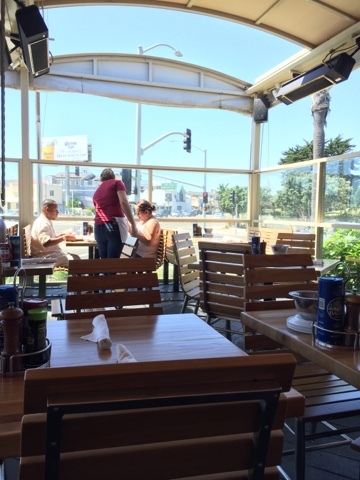 They have a covered, enclosed patio which accommodated our group, and still left plenty of room for other customers. The place sort of reminds me of a Fish Bonz or a California Fish Grill. You order at the counter and they bring the food to you. The menu is a bit more extensive than the other places, as they also have shrimp cocktail, oyster shooters, and such, but their prices seemed a bit higher than those other restaurants. I had the Parmesan Crusted Sand Dabs, while Stephen had the grilled Shrimp and Scallops. 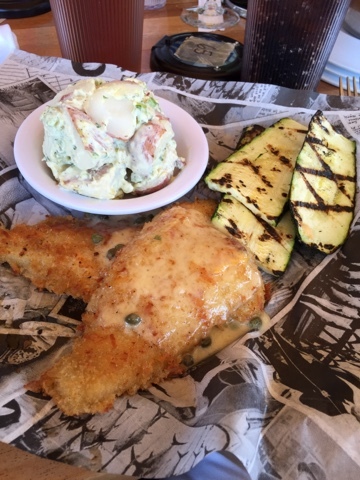 Portions were adequate, and we got to pick any 2 sides, so I chose the grilled zucchini plus their potato salad. Stephen chose the fries and the cole slaw. The sides were excellent! Generous portions, which I was able to share with Stephen. I wasn’t too thrilled on my Sand Dabs, as I thought the butter garlic sauce made it too greasy. The Sand Dab is a fragile fish, and will soak up any flavor, and so the sauce overwhelmed it. 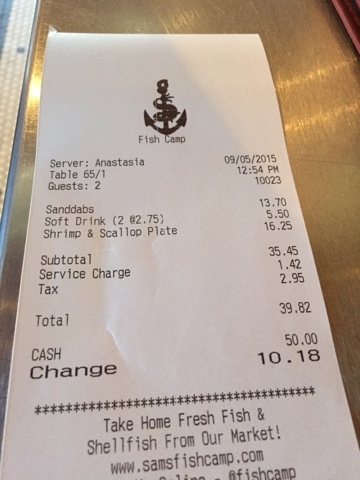 Unfortunately, I think the Sand Dabs are pre-made, as you can only get them served one way, whereas the Shrimp and Scallops could have been fried, grilled, blackened, etc. Lunch wasn’t as cheap as we hoped, but it was good food. They also add a 4% service fee to compensate their servers, every European. There’s just too many fish places out there vying for our business, so I’m not sure if we’d go out of our way here, unless we were meeting up with friends again.